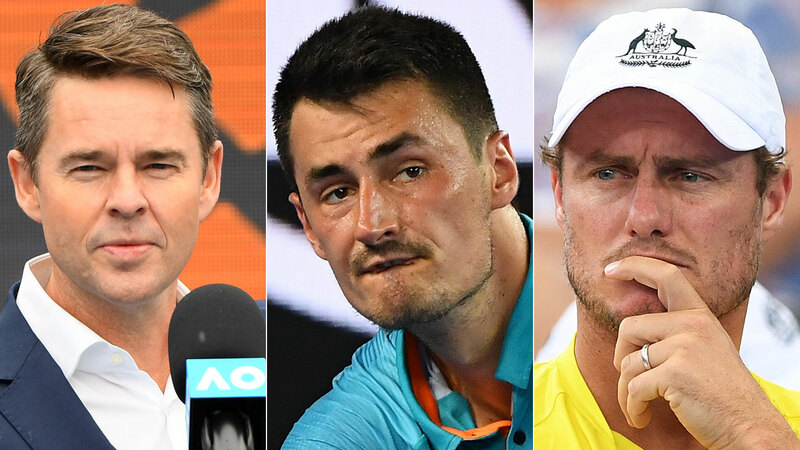 Bernard Tomic’s shocking attack on Australian Davis Cup captain Lleyton Hewitt was a blatant attempt to deflect from his poor performance, which is standard for the troubled tennis star, says legend Todd Woodbridge. Tomic unloaded on Hewitt after exiting the Australian Open in Round 1, claiming after his loss to Marin Cilic that “no one likes him anymore”. He also accused Hewitt of favouring certain Aussie players for selfish reasons and slammed him for continuing to play despite retirement. Woodbridge, who did not address the claims of favouritism, said that Tomic had fallen into the habit of blaming others for losing. “One of the most disappointing things here is it’s become his habit of deflecting a loss and deflecting what work he does to try to get better as a tennis player,” Woodbridge, a Channel Nine Open commentator who has held numerous Tennis Australia roles, told 3AW Radio. “Lleyton copped it last night. The last one that copped it, at Wimbledon a couple of years ago, was Pat Rafter. “Now, I’ve been in spaces in development that have been around Bernie and I can promise you that myself, Pat Rafter, Lleyton Hewitt – who have all got a wealth of experience in this game, both as players and dealing with media and trying to help our next generation – have given him enormous amounts of our personal time. “I’ve been away from my family and kids, as Pat Rafter did, as Lleyton Hewitt has, to enhance Bernard’s career. So it’s time he actually used some of the things that we’ve given him, the tools, and try to just get his tennis back on track. 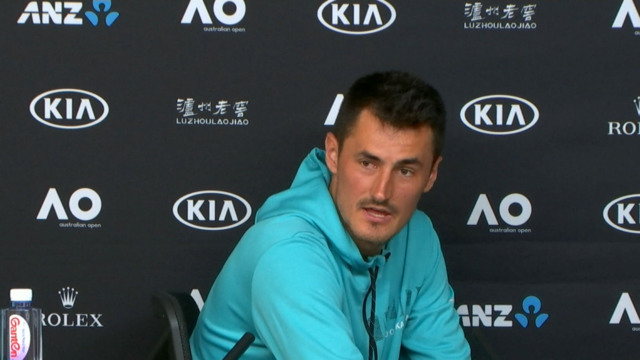 Woodbridge said he was disappointed in Tomic, especially for taking the shine off other Australian performances, and that it was time he looked in the mirror for the real reason behind his failures. “Not angry … I feel disappointed for him when you watch somebody who used those excuses as examples of their performance,” Woodbridge said. “We’re an individual sport and he has the right to do and say whatever he feels. But it is disappointing from an Australian perspective, because you can’t dish out on people who are willing to go and put everything on the line. “Lleyton left his heart and soul on the court. Whether you liked him or not, he never, ever gave up. He represented his country and still does at every opportunity, and it encourages every one of our younger players to come through to do the same. “I suppose what really does make me a little bit angry if anything is that we focus on this, instead of focusing on what De Minaur’s been doing, and what Ash Barty’s been doing, what John Millman’s been doing. Thankfully we’ve got those guys and girls coming through, that we can say, ‘This is actually the way you do it’. “You do it through hard work, determination, humility, the ability to stand up and be counted for what you’re doing well. You leave everything on the table, if you win, you lose – at least you can walk off the court, look people in the eye and be very happy with that result. Woodbridge stopped short of saying it was time for Tomic to reconsider his future in tennis. “The facts are that he’s still a good tennis player, he’s still in the world’s top 100, he’s put himself back into that,” Woodbridge said. Woodbridge also clarified that Tennis Australia could not block Tomic from competing in the Australian Open, given it was an ATP rankings event. “It’s not Tennis Australia saying, ‘We run it, you can’t play’. That would cause a bit of a player boycott unfortunately, it you went down those routes,” he said. Woodbridge said Tomic had been given no more funding to play in the Open than the expenses covered for every player. Hewitt is yet to respond to Tomic’s blast, as are fellow players Nick Kyrgios and Thanasi Kokkinakis, who Tomic implicated in “not liking” the former US Open and Wimbledon champion.